Gobi subzi / Cauliflower subzi is a very simple and quick dish which can be made within minutes. The delicious flavor of cauliflower with the combination of spice powders along with the nice texture of tomatoes makes this dish more special. Gobi subzi is not a gravy dish but can also make this recipe in a curry form by adding more tomato puree along with some cream or milk which makes a rich yummy dish. You can also add aloo / potato along with gobi ...aloo gobi subzi , which is also prepared the same way. 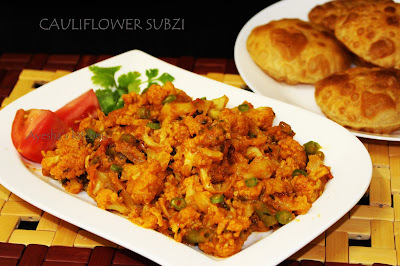 Here is the recipe showing how to make Gobi subzi / cauliflower subzi. Heat oil in a large pan and add cumin seed. Allow it to splutter and then add ginger garlic crushed. Saute for a while and then add tomato puree along with gobi florets, french beans chopped, chili powder, turmeric powder and salt. Stir to combine all the ingredients well and turn the heat to low. Add half a cup of warm water and close the lid. Let it cook for 15 minutes or until the cauliflower is well cooked. Once done, and the gravy becomes thick add the garam masala powder and chopped coriander leaves. Check for salt and spices. When done, off the flame. Serve hot with phulka, poori and is best for school lunch box.